As I said in my last post, one of the key components of the Map of Biomedicine is how new treatments get developed. That’s one of the parts of the map that is highlighted, as shown below. You’ll notice that several parts of that process mention clinical trials, which are a critical part of the drug development process. Even though I’m sure a number of my readers are quite familiar with them, I want to lay down the basics so we’re all on the same page. At its core, a clinical trial is an experiment to test whether a drug or other treatment works as it is intended. It’s pretty clear that we need to be careful about giving drugs to people. It’s great if a drug works, but giving a drug that doesn’t work is at best a waste of money, and at worst dangerous to patients. The clinical trial system is usually done in phases. In the United States, there are typically three of them, each with a different goal. There are also phase 0 and phase IV trials, which I’ll discuss in later posts. Phase I trials are focused on safety. You can do all sorts of experiments using animals and various lab tests to determine if a drug is safe, but you’ll never really know until you give it to a person. Phase I trials are usually the first time a drug has been given to a person. Clinical trials all have what are called outcome measures - this is the experimental result that is being tested. They are usually divided into primary and secondary outcome measures. A phase I trial typically has outcome measures to test how well people tolerate the drug and to test frequency of side effects. Secondary outcome measures might be ones about how the human body processes the drug and how long the effects last. In almost all cases, the measures are compared between at least two groups of patients in the trial. Those groups of patients are called cohorts, or arms. In the most common case, one arm will be treated with a drug and another arm will be treated with a placebo, which is something like a sugar pill. I’ll talk more about arms, cohorts and ways of designing trials in later posts in this series. Phase I trials often use healthy volunteers. So even if a drug is for diabetes, to test for safety, you don’t even need a person with diabetes. Some phase I trials, especially in cancer, do use patients. This is because, for life-threatening conditions, you might as well try to help patients while you are testing the drug’s safety. Phase II and phase III trials are focused on testing whether a drug provides a clinical benefit to patients. The difference between the two is usually the number of patients. Phase II trials are designed to see if the drug works in a small number of patients that might not be representative of the broader population. The main reason to do this is one of cost. Clinical trials are very expensive so doing a phase II trial with 100 patients before doing a phase III trial with 2,000 patients makes good financial sense. The outcome measures in phase II and phase III trials depend on the disease being treated. In serious illnesses like cancer, the outcome measure might be the time a patient lives while on the drug. For other conditions such as heart disease, the outcome measure might be a reduction of blockage of arteries. My next several posts will talk about how clinical trials are designed. We’ll talk more about the different arms of trials and a new kind of trial called a basket trial. As always, I’d love to hear to feedback on the post and the Map of Biomedicine. 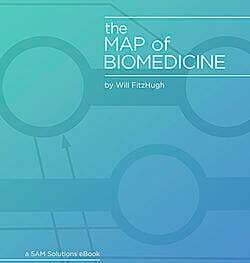 And if you haven't already, be sure to download a copy of our new ebook, The Map of Biomedicine. It includes all of the original posts in the MoB series, plus new, additional content that isn't on the web.